As global natural gas production has risen and shale gas in the US impacts on the energy outlook for that country in particular, there has been increasing discussion about the impact of natural gas on climate change. Several scientific papers have recently been released questioning the carbon dioxide benefits of natural gas over coal in power production. Perhaps the best place to start on this tough subject is to look at the basic chemistry, which at least grounds the discussion in some fact. Combusting natural gas or coal to produce thermal energy (for conversion to electricity) results in differing amounts of carbon dioxide emissions. This is because of the hydrogen to carbon ratio of the two which sets both the amount of energy released and the production of CO2. 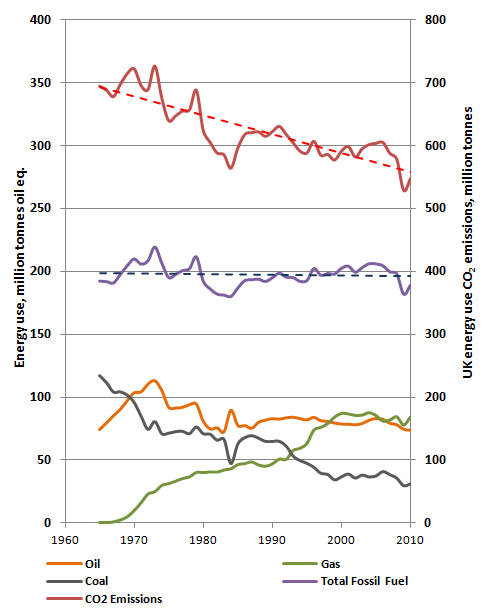 Natural gas emissions are shown as being about 40% below those of coal and 50% below those of coke simply on an energy basis (note that this is a simple combustion calculation and does not reflect factors such as the often found lower efficiency of older coal units in many countries, e.g. the IEA reports that the global average CO2 emissions for electricity/heat generated from coal is 904 gms CO2/kWhr, vs. 386 gms CO2/kWhr for gas). So substituting natural gas for coke / coal in an economy can lead to emissions reduction from the power sector. This has been seen in the UK (Source: BP Statistical review of World Energy) where natural gas use has grown substantially over the last 30 years. Total UK fossil energy use has been stable over that period, whereas emissions have fallen by 20%. As I illustrated recently for the USA, this means natural gas offers an economy an energy pathway forward which can both underpin growth and deliver emission reductions. Importantly, gas is affordable, particularly given its low sulphur and particulate emissions, so it doesn’t require heavy handed policy intervention such as high feed in tariffs. In the case of the USA, such an outcome may be delivered anyway because of the retirement of older coal plants as they face new air, waste and water regulations, coupled with the powerful economic pressure of an abundant, indigenous and cleaner energy supply source. But such a pathway is not always guaranteed and could be delivered with increased certainty by having a carbon price operating in the economy. Some observers are concerned that such a change simply locks in a new, albeit lower, emissions pathway and sets up the economy for problems later on when very deep emission reductions are required (although in many countries gas infrastructure already exists). But such a pathway forward should not necessarily be dismissed, as it can have positive implications for the global negotiations, particularly when the USA is involved. With the current focus on the economy, short to medium term emission reduction targets are proving to be a significant impediment to action in a number of countries. This in term destabilizes the global discussion on climate change. A national route forward at modest cost can potentially contribute positively to the broader discussion. This isn’t the end of the story though. There has been recent focus on the methane emissions related to natural gas production and delivery to market. For example, a study by Cornell University argued that emissions from shale gas production meant that use of this fuel in the energy system may be little better than coal (although a number of questions have now been raised as to the accuracy of this study). However, a more recent analysis by Carnegie Mellon found that the life cycle GHG emissions of Marcellus shale natural gas are estimated to be 63–75 g CO2e/MJ of gas produced with an average of 68 g CO2e/MJ and that Marcellus shale natural gas GHG emissions are comparable to those of imported liquefied natural gas. Therefore, gas still delivers an advantage over coal and as such, shale gas can also be the driver of national reductions such as those seen with gas in the UK. The atmospheric methane issue is one that is posing some interesting questions. Two recent papers in Nature discuss the issue in response to the fact that the previously increasing atmospheric methane concentration has inexplicably stalled over the past three decades. This may be due to a fall in fossil-fuel emissions or to farming practices that are curtailing microbial sources. Certainly the fossil fuel industry has done a great deal to reduce methane venting, a common practice up to the 1990s. Today, even remote natural gas has much greater commercial value thanks to the development of a global market, which in turn makes venting and leakage just poor business practice. The leakage rates assumed by Wigley range up to 10%, which in practice would be a considerable commercial penalty for a project. Carbon dioxide is a stock pollutant, which means that the cumulative amount emitted over time matters. By contrast, sulphur drops out of the atmosphere very quickly (weeks to months). Should coal use decline in the future or sulphur emission standards become even stricter or at least more widespread, the climate protection currently offered will decline. At that point, the benefit of a lower stock of atmospheric CO2 as a result of earlier use of natural gas would be advantageous. The stock pollutant argument also means that the earlier coal is backed out of the power generation system the better. Such a move would also deliver local air quality benefits in many places. Eventually though the issue does come back to the stock of CO2 in the atmosphere. In 2009 I discussed a paper on this issue published by Nature. Assuming an atmospheric carrying capacity of one trillion tonnes of carbon, equating to 2 deg.C, a business as usual pathway would see this limit exceeded in 2044. Even if there is massive global replacement of coal with natural gas over the next 30 years, we still wouldn’t get far into the 2050s before this limit was breached. So natural gas may gain us some valuable years, but before long it will also need decarbonisation options. This then points to the future need for carbon capture and storage (CCS) and of course a big push on renewable energy and nuclear power. All of these technologies also have issues related to cost, public acceptance, technical capacity and suitability for grid management. So it really comes down to a question of balancing emissions targets, cost and meeting the continually increasing demand for energy. In the short to medium term, natural gas potentially does all of these. Emissions targets can be met at modest ( or possibly zero) cost and energy demand is satisfied. 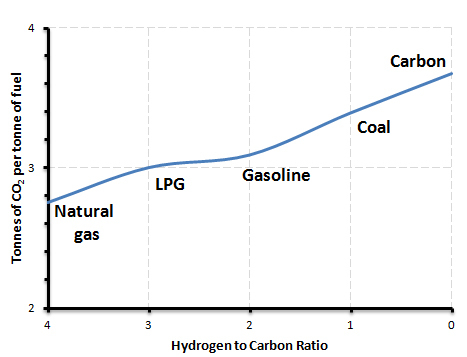 As natural gas use increases in deference to coal there is the benefit of a lower stock of carbon in the atmosphere. Finally, as we face up to a world of really deep emission cuts, natural gas with CCS offers a further low emission energy source which can compete with nuclear and renewable sources. allow guest posting? I can write high quality posts for you.